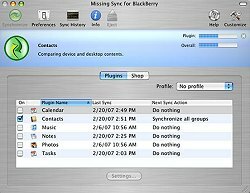 The Missing Sync for Mac and Blackberry | BlackBerry Blast! Mark/Space has released a "public preview" of its upcoming software "The Missing Sync for BlackBerry." The software enables Mac users to sync their data with a Blackberry. The Missing Sync for BlackBerry enables you to sync your contacts, calendar, notes and other data with your BlackBerry. If you have a BlackBerry Pearl model or Blackberry 8800 you'll also be able to sync iPhoto albums and iTunes playlists with your device. The full release of "The Missing Sync for Blackberry" is expected to be released sometime at the end of the quarter.